Publication Information: New York, N.Y.: Metropolitan Books/Henry Holt and Co., c2008; 1st ed. United States–Foreign relations–Comic books, strips, etc. United States–Territorial expansion–Comic books, strips, etc. United States–Social conditions–Comic books, strips, etc. Social movements–United States–History–Comic books, strips, etc. Zinn, Howard, 1922- –Comic books, strips, etc. Historians–United States–Biography–Comic books, strips, etc. This isn’t the history you learned in grade school. The graphic novel hits key points in U.S. history, led by Howard Zinn, who is portrayed as a speaker at an anti-Iraq War rally. 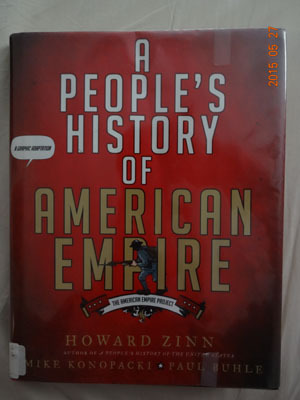 Zinn starts at the end of the nineteenth century, with the massacre at Wounded Knee, then goes on to discuss the Spanish-American War, and the conquest of the Philippines. The socio-economic conditions in the country at the turn of the century and how the so-called “robber barons” exploited the masses. 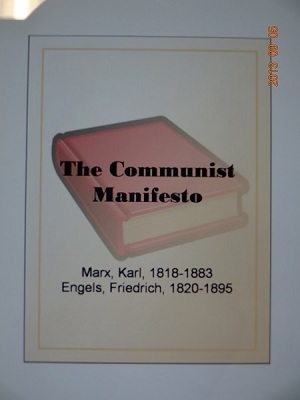 This led to the creation of labor unions–and how the U.S. government did everything in its power to assist the capitalists against the unions. All activities of the U.S. government are for capitalism–the military-industrial complex that Eisenhower warned of in his farewell speech. Nothing here was of any great surprise to me. There were some “Ahhhhh” moments, such as the revelation that Woodrow Wilson, in an attempt to ensure that the Entente Powers could continue to buy American-made munitions even when bank credits could not cover the cost, allowed the Federal Reserve Banks to accept “bankers’ acceptances” from them. This, according to Zinn, amounted to an act of war (p. 84). Then there was the suggestion by Zinn that the U.S. dropped the atomic bombs on Hiroshima and Nagasaki to quickly end the war before the Soviet Union could invade Japan. Thus, the Japanese surrendered to the U.S.
Then there’s the depressing antics of the Central Intelligence Agency in Latin America: El Salvadore, Nicaragua, etc. that merely created misery for the people in those countries. Neither the Democrats nor the Republicans differ on their foreign policy, which is done to create new markets. The Iran-Iraq War? We supplied both sides with armaments. Making money is the name of the game. Iran-Contra is covered, and the only man who went to jail (for four days) from it was sentenced for stealing a street sign (p. 230). Perhaps the most bizarre chapter in the whole book is seven, “The Cool War.” In the 1950s, there was a concerted attempt to enforce conformity to prove that the “American way of life” was far superior to communism. However, war was declared on those who wore the “zoot suit,” a fashion statement that was seen as subversive during the war and after. There were attempts to keep apart Mexican Americans, African Americans, and White Americans as they listened to R&B and danced to it. Comic books came under fire as “subversive,” which led to self-censorship under the Comics Code Authority. “Loyalty oaths” were forced on workers in government and the private sector. It was in this atmosphere that Eugene McCarthy’s communist witch hunt thrived. A very thought-provoking book. Zinn ends on a positive note. Things CAN be changed, as the end of the Vietnam War, segregation, and Solidarity’s eventual overthrow of the communist system in Poland, demonstrate. People can change the system for the better.